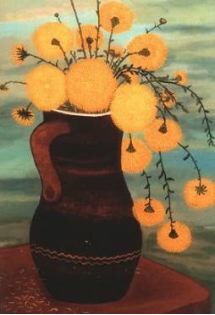 Ivan Lackovic was born in the village of Batinska in 1932. He was one of four brothers with a difficult childhood. Life became even harder after his father died when Lackovic was thirteen. Nonetheless, he successfully completed four years of elementary school, even though it was 6 kilometers away, and in his spare time he started cultivating the family plot of land. Subsequently, he worked on a forestry plantation and as a postman. After he and his wife married, they decided to move to Zagreb, as many people had done before them, to try urban life and find work in a factory. Lackovic’s breakthrough in painting came when he decided to transform the exterior of his house into his ideal home--guardian angels were depicted watching from above and the imaginary garden was filled with beautiful flowers. The local art teacher praised his work and provided Lackovic with the encouragement to continue painting. Although Lackovic appreciated his urban comfort, he continued to miss the country life. It is through his paintings that he reveals how much he cherished the lifestyle he grew up with, even though winter scenes with crisp snow, blue skies and people wearing their best clothes reveal nothing of the harsh reality Lackovic himself experienced. Instead, the paintings, which are richly detailed and show his skill and sensitivity for composition, lend everything an aura of serene contentment.